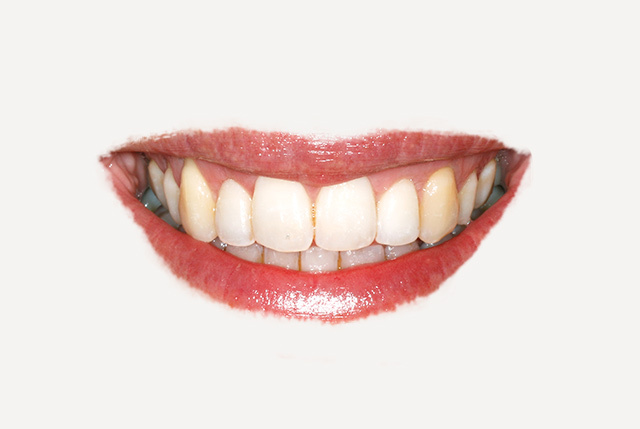 When they smile, some people show too much of their gums and small, square teeth. 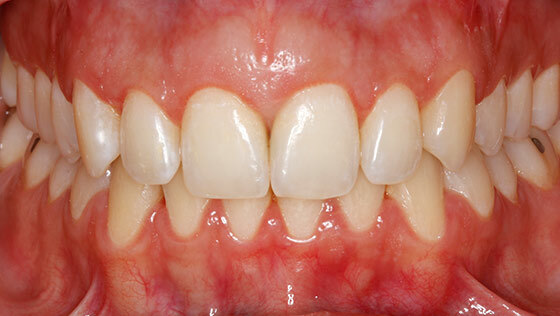 The aesthetic problem in this case was excessive gum overlapping part of the row of teeth. This occurred because the patient’s teeth did not “erupt” (come out) completely when they should have done and by now she was an adult. 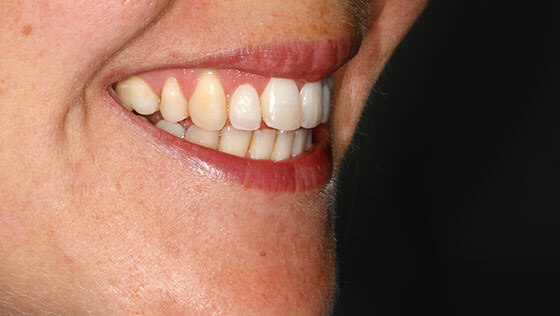 This treatment consists of periodontal surgery known as crown lengthening. 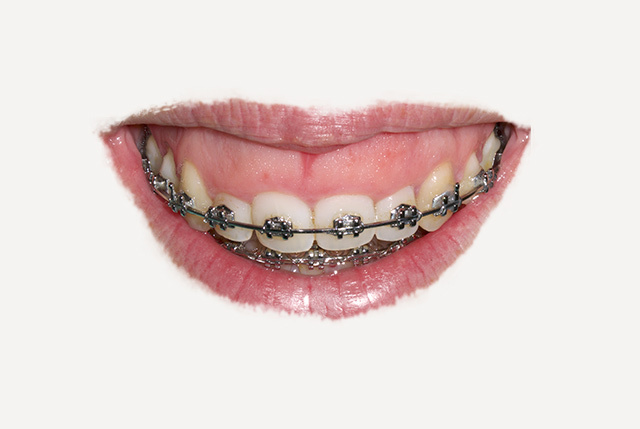 It is a simple type of corrective surgery for outpatients that involves repositioning and re-contouring the gum towards the base of the teeth, thus allowing more enamel surface to show. 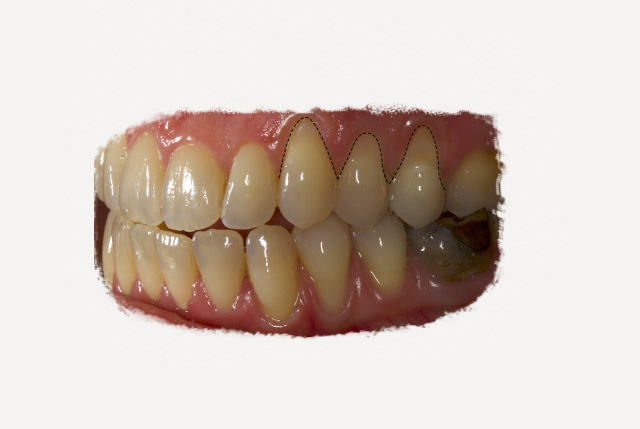 Through crown lengthening surgery, the gum concealing part of the teeth is repositioned, thereby achieving a significant improvement in the smile’s aesthetics. 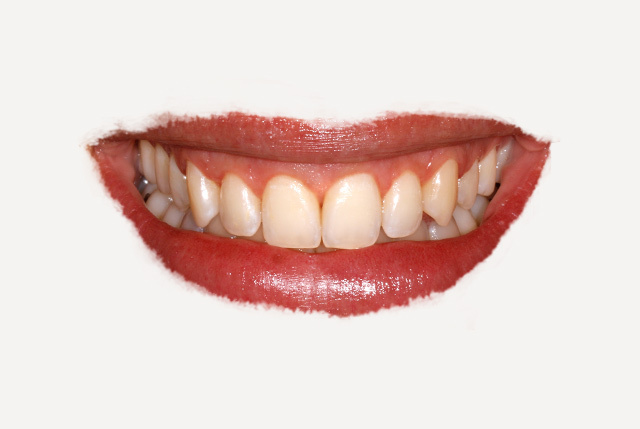 If the upper lip is too short for the bone and teeth it is supposed to cover or the upper jaw is too long for the lip that covers it, then there is an excessive amount of gum showing when you smile. In this case, we had a gummy smile caused by a combination of: 1) an excess of upper jawbone and 2) an altered passive eruption of the teeth. The resulting look was as if the teeth and the mouth were out of place. This treatment requires two very different surgical procedures. The first involves correction and gingival levelling of the gums to uncover some of the surface of the tooth that has “insufficiently erupted” by means of periodontal aesthetic surgery (see case M, too). In the second operation, we lower the upper jaw by performing ostectomies and orthognathic maxillary impaction (or “open bite”) surgery. One-day hospital admission. Operation carried out in collaboration with the maxillofacial surgeon Dr. Joan Birbe. 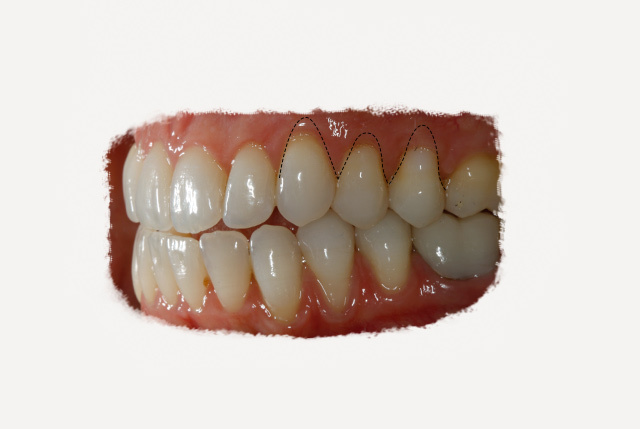 The combined work of periodontics and orthognathic surgery enables us to reduce the vertical excess of gum showing when the patient smiles in cases where both of these problems exist. 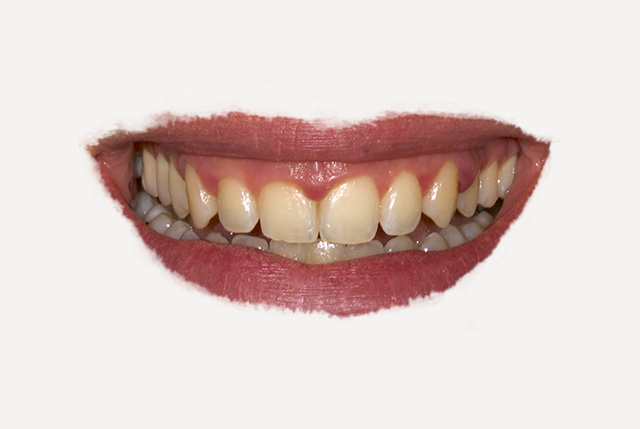 The end result is a truly positive, pleasing change to the face’s appearance. The problem here is that the teeth are very long and often very sensitive. 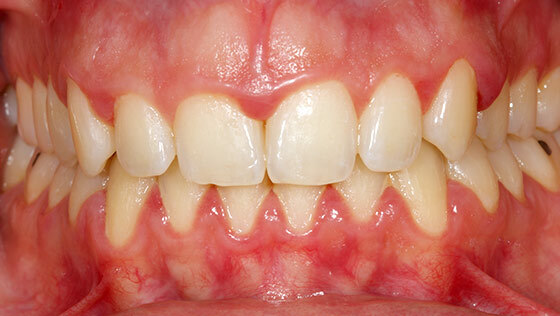 Gingival recession occurs when the gums and bone covering the teeth begin to shrink or recede. 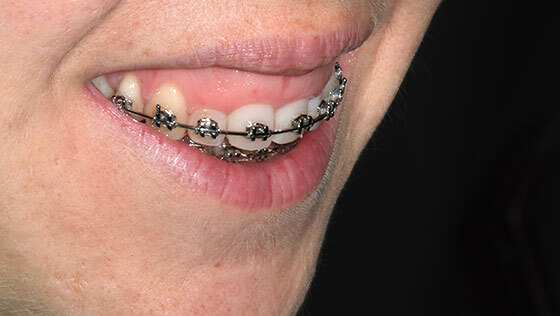 This can be due to aggressive brushing, grinding or crooked teeth. 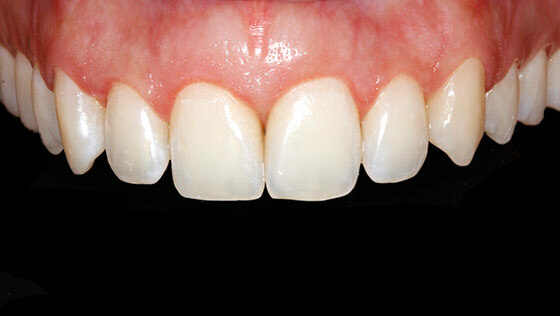 We the cover the “naked” roots that reveal teeth that are too long by using grafts of “autologous” gums (i.e. using some of the patient’s own gums). 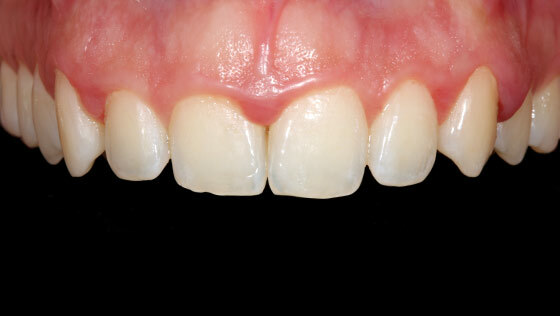 This is a simple outpatient microsurgical correction that involves grafting and moving the gum lower, thus covering a greater area of the tooth’s root. We prevent the tooth’s roots from being exposed and remove the sensitivity and pain that we used to feel when eating hot or cold food. In doing so, we also improve the smile’s harmony. From a preventive perspective, we stop the roots from continuing to “lose their gums”. 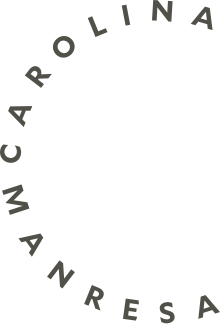 We would like to thank the patients treated by Dr. Carolina Manresa for kindly allowing us to use the images published in this Dentistry Alphabet, thereby helping to raise awareness of this clinical practice. In accordance with the provisions of Organic Law 15/1999 of 13th December on the Protection of Personal Data.